This was a terrific first recorder, I got it in May 2009. The mics were very sensitive, and playback was loud with 350mW of power through a 28mm speaker. And it was small and light weight, a very good all around solution. The only niggle was it recorded in a proprietary Sony format which you had to convert to MP3 with included software. Cost at the time around US $200, but now out of production. Unfortunately I lost the recorder in a downpour on Gunung Kerinci in March 2013, and so I needed a replacement. Searching through what Sony currently had available, I found no direct match, so I wound up getting a Sony ICD-AX412. This had a bit less power 300mW but still had a 28mm speaker; and it turns out playback is adequately loud. But the mics are not very sensitive, so you have to be very close in order to get a decent recording. My percent of good recordings of bird songs went way down, and I wasn’t very happy with this solution. Cost at the time though a very reasonable US $70, and very light weight and easy to carry. So after a bit over a year of ownership I started looking around for a better recorder. 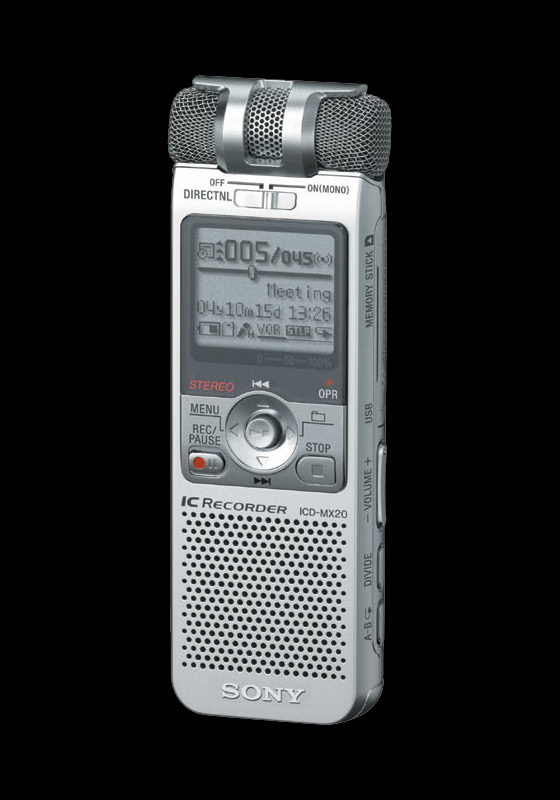 In my opinion the problem with shopping for a relatively small handheld recorder is it seems the manufactures don’t publish very complete specifications, so you are left to guess or try them out in a retail store. In the a store environment, it’s so noisy that it’s hard to draw any conclusions. 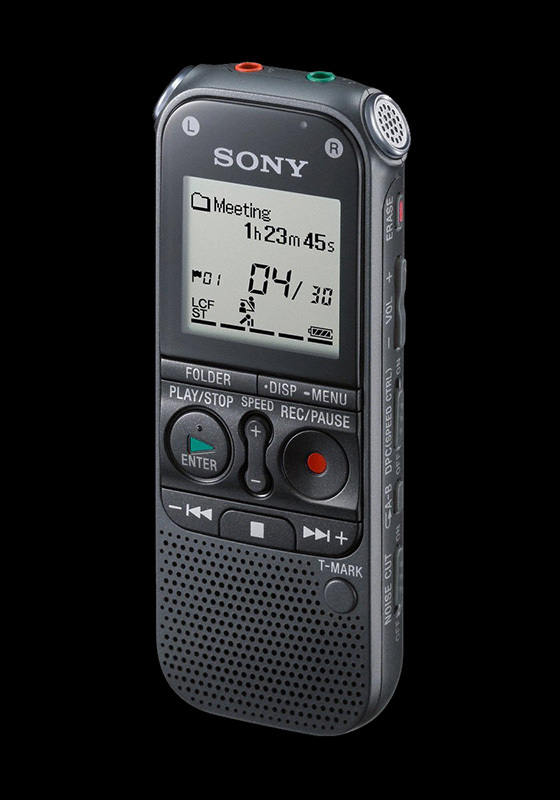 For example the Sony PCM-D100 recorder which retails for around US $770 doesn’t have any published specs for how sensitive it’s mics are, that’s a lot of money to spend and not know what you are going to get. Asking around I found that a lot of birders are using the Olympus LS series of recorders. So goodbye Sony, hello Olympus. At the time I was shopping the two models available were the LS-12 and LS-14, with the LS-12 being the same as the LS-14 minus a few unimportant features and shedding some cost. The bigger, bulkier and more expensive LS-100 wasn’t seriously considered. From the limited specs published, it had the same 28mm speaker and 300mW of audio output as I’ve previously found useful in other recorders. But once again, no specs on the mics. While researching this model, I came across the website of a German company who makes software and hardware for bio-acoustics recording, by the name of Avisoft Bioacoustics. One of the most useful pages on their website is an objective ranking of portable recorders in terms of their noise characteristics, http://www.avisoft.com/recordertests.htm. There is a lot of other very useful info on their site, well worth checking out. But from the recorder tests page, I could see that the Olympus LS-12 had a very acceptable noise performance for the price. In September 2014 I went ahead and bought one for the very reasonable price of US $115 on sale. Taking it out into the field I quickly noticed two things. (1) sigh, the mics are not very sensitive, not like my original Sony way back in 2009! (2) but the electronics of the recorder were much improved with less self noise than any recorder I had previously owned. So I could boost the recording in post production and get a useful bird song. As a stand alone all-in-one solution for bird recording and playback I can only give the LS-12 middling marks. The speaker is big enough and loud enough that if you get a close recording you will have adequate playback in the field. But the mics aren’t very sensitive and most recordings require some boost in post production which you can not do in the field. If only the device had more playback gain, you could compensate for the softer mics. The device is also bigger and heavier than my prior two Sonys. And you have to be really careful to actually turn the device off, if you just let it go to sleep, the batteries drain in a matter of days. On the plus side, the recordings have low self noise which allows them to edited with good results. And you can record in MP3 up to 320 kbps or Linear PCM (wav) up to 96 kHz 24 bit. Recording in the Linear PCM format is the sound equivalent of saving photos in lossless RAW format, everything is captured, nothing is lost. And a feature handy for nature sound recordings is the ability to capture 2 seconds of buffered sound before you press the Record button. This means if you hear a bird start to sing, you can press Record and you will also capture the 2 seconds of sound before you pressed Record. A year passed and although I was satisfied with the Olympus as a recorder, I was keen to improve on the mics. 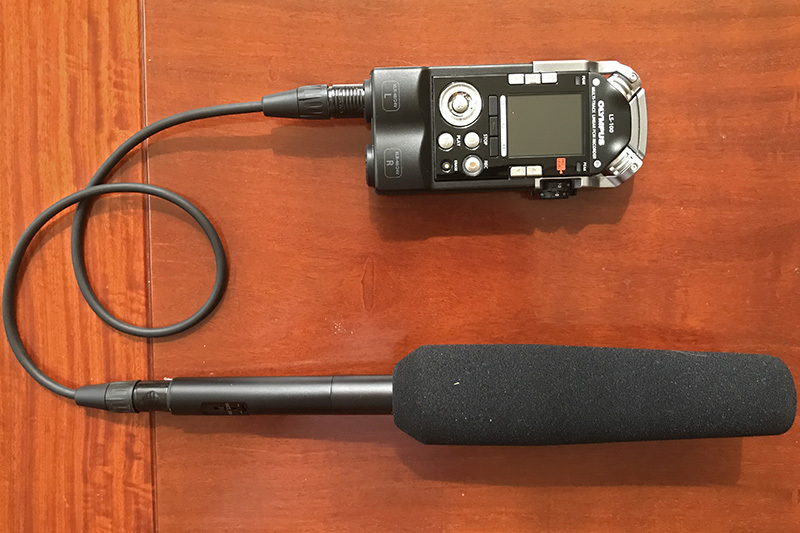 I realized this was a good enough recorder to plug an external mic into, so I began to research shotgun mics from two of the more well-known companies, Sennheiser and RØDE. I looked at price, weight, length and power source. Power source is important because I am using a mini 3.5mm jack on the LS-12, and not XLR connectors with 48v phantom power, so I needed a mic that can also be battery-powered. That immediately narrows the playing field to a few models from each company. Bubbling to the top of the search results are the Sennheiser ME66 and ME67 mics. These are hands down the hottest mics (meaning most sensitive) in the field of mics that otherwise meet my criteria. 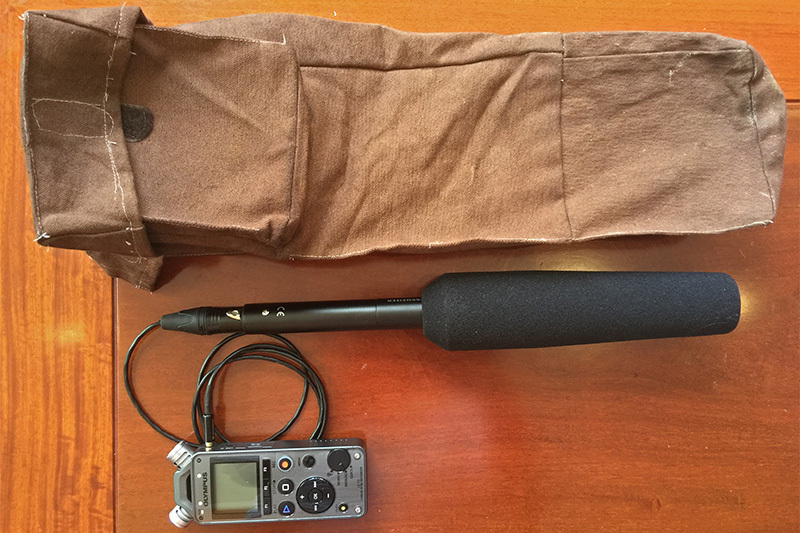 A hot or sensitive mic is a key requirement for nature sound recording simply because natures sounds, especially bird songs, are likely to be soft and far away. Shown below are both the ME66 and the longer ME67. Shotgun microphones are directional by design, providing good attenuation of sounds the mic is not aimed at. 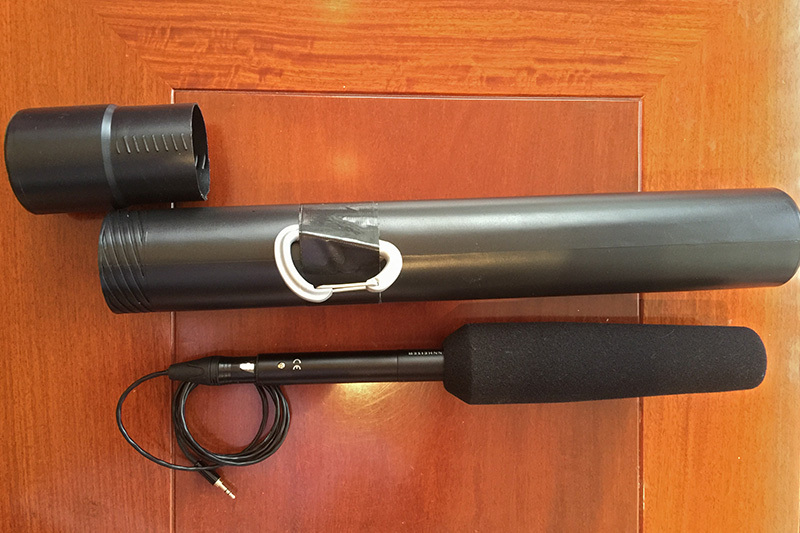 The ME67 being a longer shotgun mic will provide even better isolation of the desired sound from the unwanted sounds, providing perhaps 3 db or a bit better gain. The assembled length of the ME66 with K6 power module and foam windscreen is already 13″ while the ME67 would add another 5″. Prices are very similar though. Anyway I decided the ME66/K6 at 13″ was long enough for me to deal with in the field, given all the other gear, bins, and cameras that I’m carrying. Another useful reference is to look at what sound recordists who contribute to Xeno-Canto are using. You can look at the individual profile of each contributor and often it will say what gear is being used. http://www.xeno-canto.org/collection/stats/recordists You will see that a lot of folks are using Olympus LS series and Sennheiser ME66 or ME67 mics. So I took the plunge and in September 2015 acquired the Sennheiser ME66/K6 and a foam windscreen for about US $500. During the first field trial and first recording it was immediately clear this was a very good match for the Olympus LS-12. The recorder was able to capture good, clear, loud bird songs; and playback in the field was also clear and loud. Now the only issue was dealing with its size. 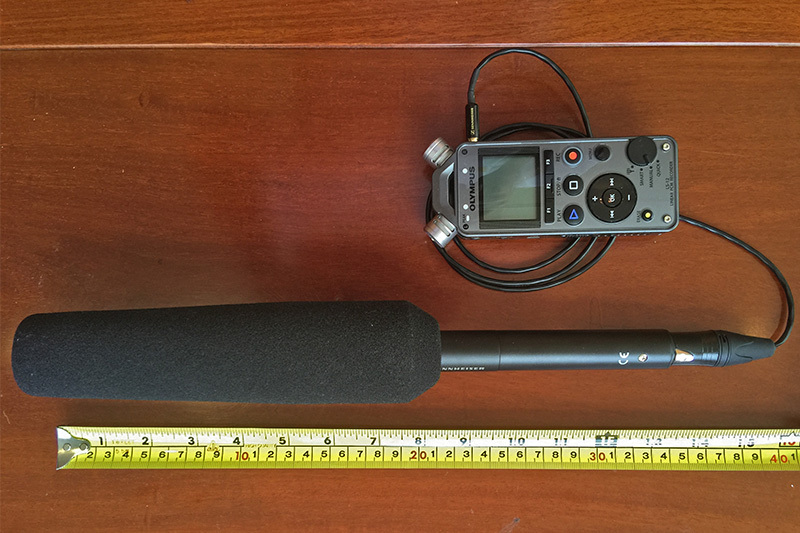 The ME66/K6 with XLR connector plugged in is almost 16″ long. So I had a canvas holder custom-made and dyed brown to carry this in the field via a belt loop. Still a bit to carry all day, but the results are certainly worth it. Another solution for carrying the microphone on your belt. I bought a plastic tube designed for carrying artist’s work. It even comes with a screw top, making it quite rain resistant. Then I simply taped on a D buckle, all for about USD 5. A really good solution for carrying the mic with foam windscreen, but won’t be big enough in diameter for a “shaggy dog” too. Do not expect miracles however, if a nature sound is really far away, this setup won’t magically drop it in your lap. The nature sound still must be reasonably loud and close, say on the order of 10 meters, in order to obtain a satisfactory recording. The next step up from this setup would be the big leap to a parabolic mic. And for bird song recording, a company in Sweden called Telinga seems to be the most popular choice. http://www.telinga.com/ So in case you want to skip all the intermediate steps and jump directly to the ultimate solution, you can get their Universal Kit Mk2 for just US $750. But then bear in mind you are no longer bird watching, you are now bird listening. The parabolic dish is so directional you will need to wear headphones just so you can aim it correctly. 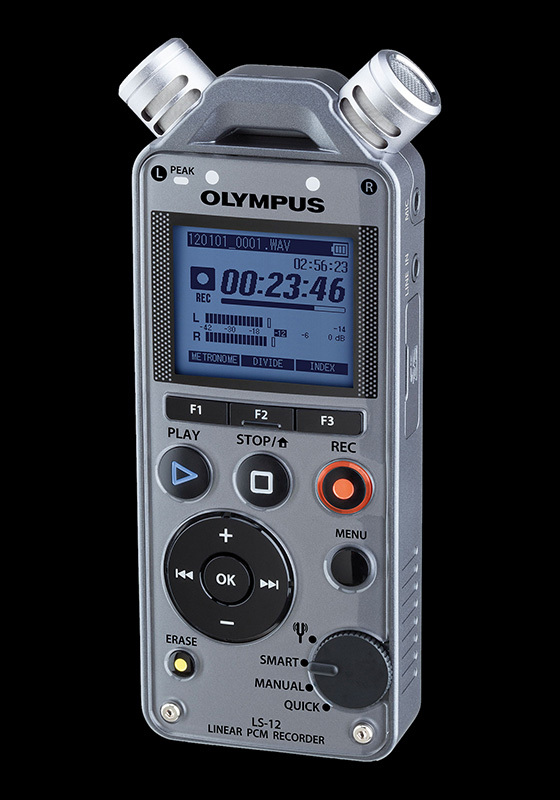 And then most users purchase a much better field recorder such as the drool worthy Sound Devices 702 http://www.sounddevices.com/products/recorders/702 which goes for a breath-taking US $2,050. So a parabolic mic is in an entirely different league in terms of cost and your necessary dedication to the craft. It would not be for the casual user. As such I will enjoy my ME66/LS-12 combo for sometime to come and look forward to capturing lots of nature sounds. Then, as luck would have it, about two years into owning the ME-66, the alkaline battery leaked and I had to take the mic in for service. Sennheisser did a good job and completely restored the mic to full operation. But as result a couple of thoughts occurred. I should have used a lithium battery, they don’t leak. Even better would be to use a recorder with phantom power and not need a battery at all. So I bought probably the last Olympus LS-100 in Singapore, now no longer in production. The Olympus LS-100 is even a bit better than the LS-12. Probably the best field recorder they have ever marketed. Sad they don’t continue to spin this product line. The XLR connectors are very sturdy and not subject to failure like the mini 3.5mm plug is. When used with phantom power the specs of the LS-100 are about 5db quieter (less noise) than the LS-12, which is pretty helpful when trying to record faint nature sounds. 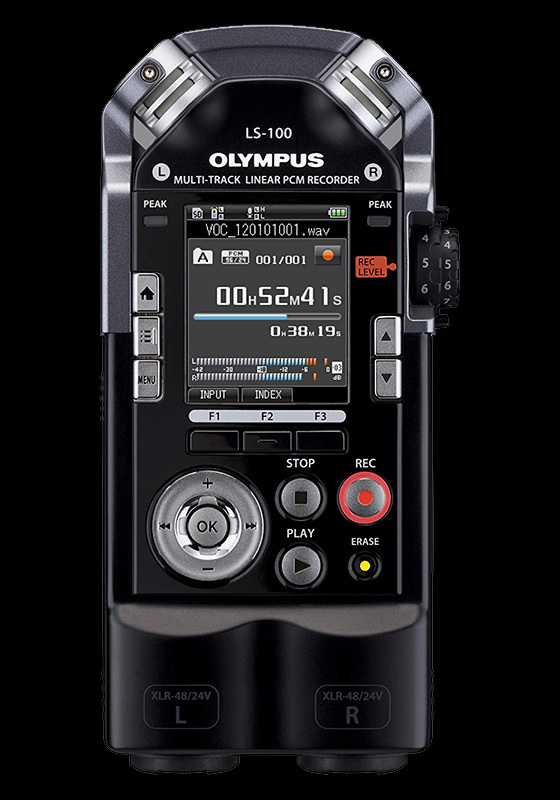 So the LS-100 has now become my preferred recorder, although it is a bit bulkier than the LS-12. Here is a view of the recorder and microphone together, you need two hands to operate this! So far, this is where I have progressed with gear, but I also wanted to check out the Zoom H5 with SGH-6 shotgun microphone. https://www.zoom-na.com/products/field-video-recording/field-recording/zoom-h5-handy-recorder. This is a mid-range product, priced below the kit I have listed above, but more than entry level products. The Zoom H5 with SGH-6 has become quite popular with birders as it has the advantage of one handed operation compared with Sennheiser and a separate recorder. Poking around the Zoom website I stumbled across an actual spec that can be used to compare this product with the Sennheiser ME66. All microphones converter sound pressure to electrons. The Sennheiser is spec’d at 50mv/PA, the Zoom SGH-6 is spec’d at 11.2mv/PA which is about -13db less than the Sennheiser. This is a noticeable difference, putting this in terms that birders might find more understandable, if the Sennheisser recorded a bird song at a certain distance, and at the same time the Zoom H5 with SGH-6 recorded the same bird song, it will appear that the bird recorded with the Zoom was 4.5 times further away than the Sennheiser. That’s a pretty big difference, I think I’ll keep my current kit and just live with the two handed operational requirements. Posted 27 November 2015, updated 8 August 2018. Really enjoyed the trip and getting to know you and the guys. This blog is incredibly useful and I will go out and buy your setup. I can see a whole world of observation and analysis opening up. Good luck and thanks. Funny how you ended up with identical gear as I use. I have noticed that leaving the wire attached to the mike often causes the wire to malfunction. Thus I am on and off with the wire which is a bit of an inconvenience. I don’t have a wind breaker but I am very happy with the set up. Just need to go birding more on my own. Where can we listen to your recordings of birds? I am curious. I owe Ls-12 too, but batteries runs out in 1 day, while it’s off. Do I turn it off somehow wrongly? Hmm.. don’t know what to do with this issue. Hello, you must actually turn off the LS-12, if you simply let it go to sleep without turning it off, it will quickly drain the batteries. I made the same mistake too when I first got the recorder. Sorry I haven’t posted many of my bird song recordings yet, someday I will post to Xeno Canto. Can you Send me the pries. Hi Dhammitera, you can look up the prices in your local area, they may be somewhat different from country to country.